The photo above shows the diving pool at Slide Hill Park under construction circa 1973. 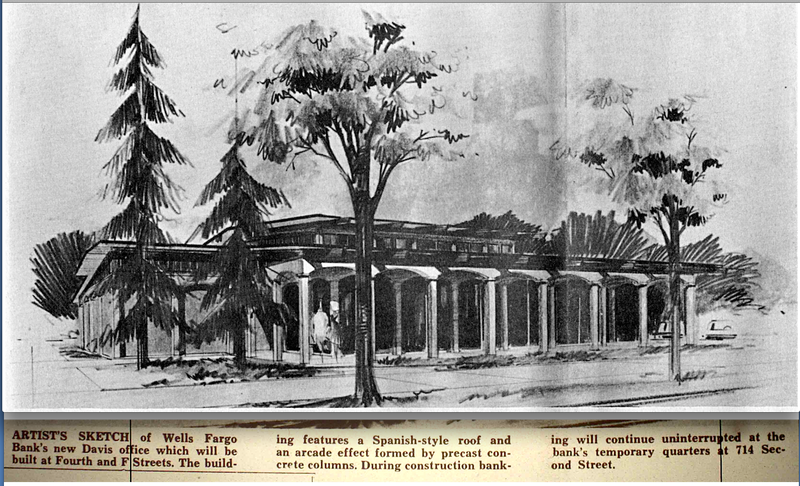 The homes under construction include 2900 Temple Drive (on the left) and 2917 Grinnell Drive (on the right). The second photograph is taken in 2014 and shows that buildings housing pool equipment have been replaced and considerably upgraded since 1973. The construction edges of tract home areas are in their nature “ragged.” Open land is being converted to housing. That is a messy process made dramatic by juxtaposing an existing ecology, raw destruction, and new construction. For some five decades in the last half of the twentieth century in Davis, such ragged edges were rather common and almost continuously on display. But in the last two decades or so, they have become rare to the point of nonexistent. In the spirit of recalling those heady days of rampant ragged edge tracts home development, let me share of a few photographs of the phenomenon. These are photos of the “ragged edge” phase of the construction of a Stanley Davis “Alpine” home on Tulip Lane near Loyola Drive in 1971-72. 1. 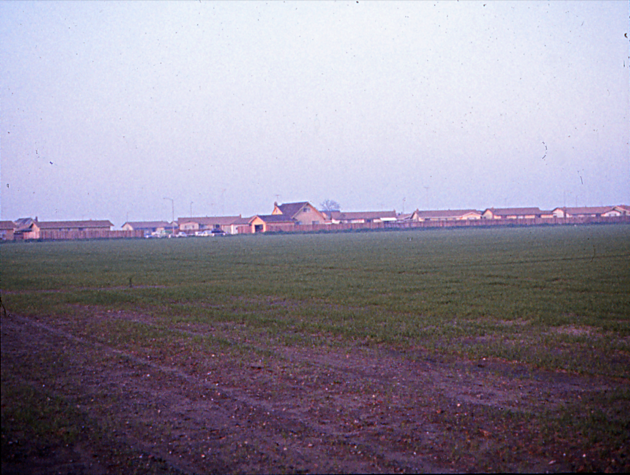 The yellow two story “Alpine” in the middle distance is 1220 Tulip Lane, a street that ended in front of that house in 1971-2. 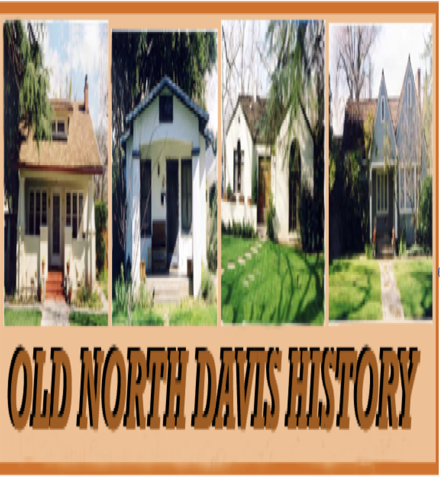 The house is situated in the long edge of houses making up Davis Manor subdivisions numbers 15 and 16. Today, the field we see here is Sunnyside subdivision No. 1 and Mace Ranch Park subdivisions numbers 03 and 04. 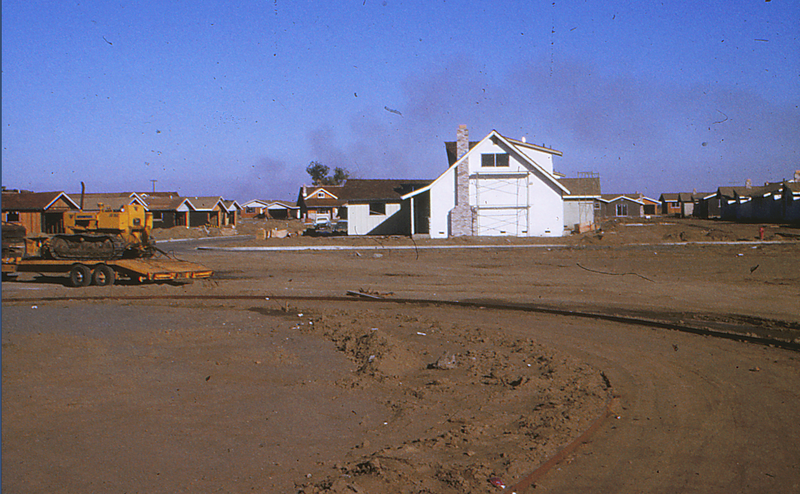 Explosive tract home growth over the ‘50s-‘70s meant that many areas of Davis were conspicuously “raw” at any given time, as seen in this 1973 shot of a Stanley Davis “Alpine” model (in the center) on Grinnell Drive abutting what will be the new Slide Hill Park. 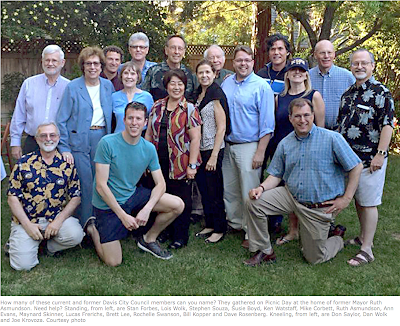 The 17 people pictured are 47% of the 36 elected since the earliest elected attendee (Mayard Skinner, 1966). This is impressive and even more so when one subtracts the 5 elected who are deceased and the 8 who are alive but no longer living in Davis. 36 minus 5 deceased and 8 moved away leaves 23 likely attendees. 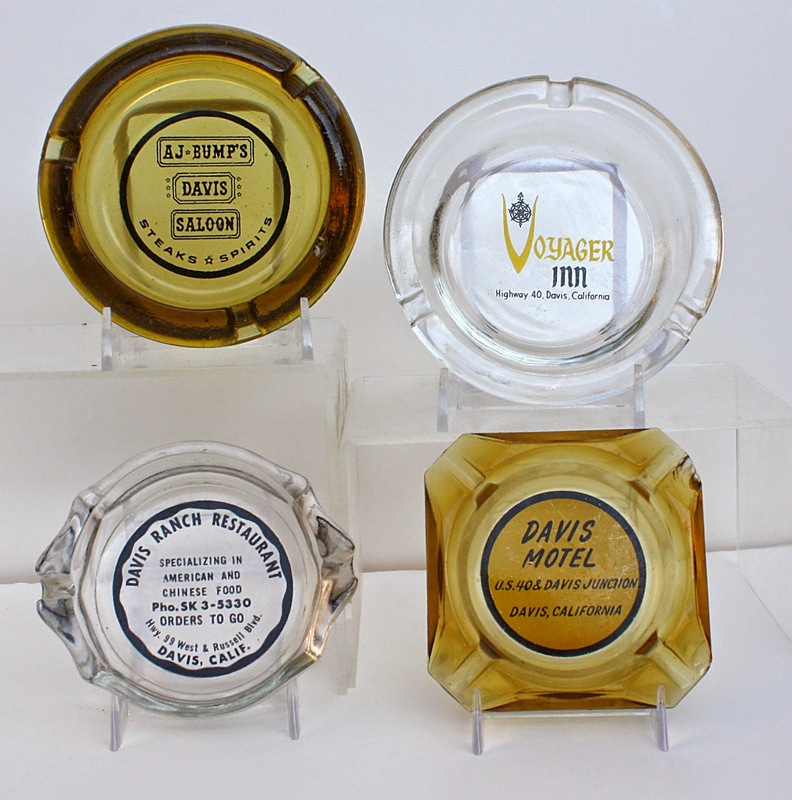 The four motel and restaurant ashtrays from the 1960s and thereabouts pictured here are of interest because one no longer sees them in either type of establishment--or at least not with great frequency. Of note, items of this kind have become collectors’ items and are bought and sold regularly in such venues as eBay, where these four were purchased. one-sixteenth of its physical “footprint” would have been created in each decade. But this did not happen. 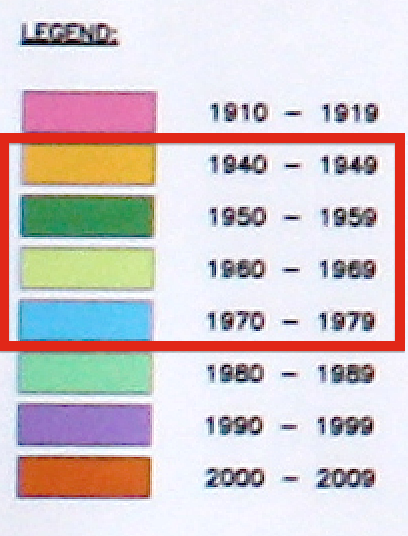 Instead, the greatest growth was concentrated in the four decades of the 1940s through the 1970s. The blacked out areas on a recent City of Davis “Annexations By Decades Map”* (reproduced in this post after "the jump") show areas created before and after these four decades. inventory of candidate historical resources. 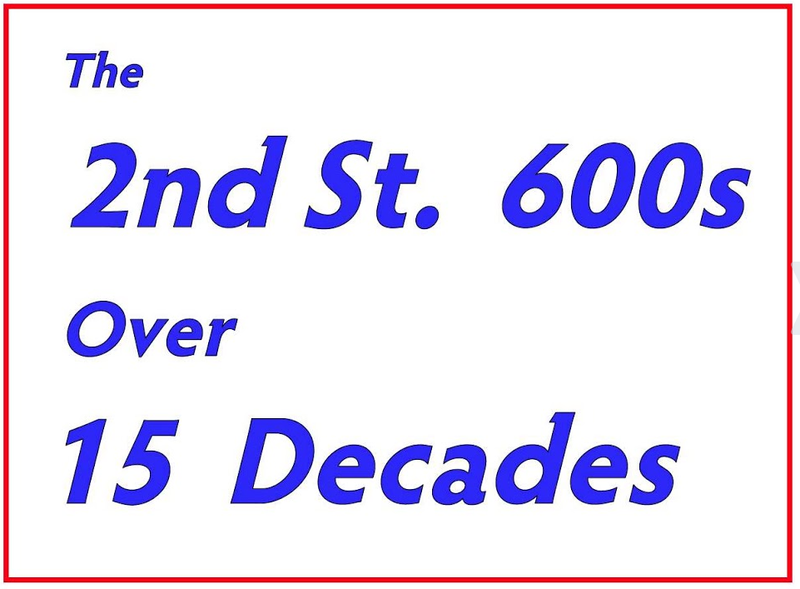 This effort is focused on the years 1945-1975. Given that Davis growth was exponential over those 30 years, the surveyors certainly have their work cut out for them. Indeed, I am so overwhelmed when I contemplate the task facing the surveyors that I have retreated, at this time, to thinking only about a few obvious candidate “historical resources” built in that 30-year period.